Everything you need to know! Learn about all the features that come with your product and steps to get your product up and running in no time. PainFixMD, electrical nerve stimulation, is a drug-free alternative for managing pain. A PainFixMD unit device looks like a small cell phone and has one or two sets of wire leads attached. The wire leads have a set of self-adhering pads attached to them. This device generates a gentle electrical current that travels through the lead wires to the pads to the body. The therapy works to decrease pain levels by electrically stimulating the local sensory fibers. A PainFixMD device is a safe option for many, however, if you have a pacemaker or are pregnant, you should avoid this type of therapy. The unit applies electrical stimulation across a painful area. Electrical stimulation was first used in ancient Rome to relieve pain by using electrical fish from the sea. Later, a variety of other devices were used to treat headaches and other pain conditions. 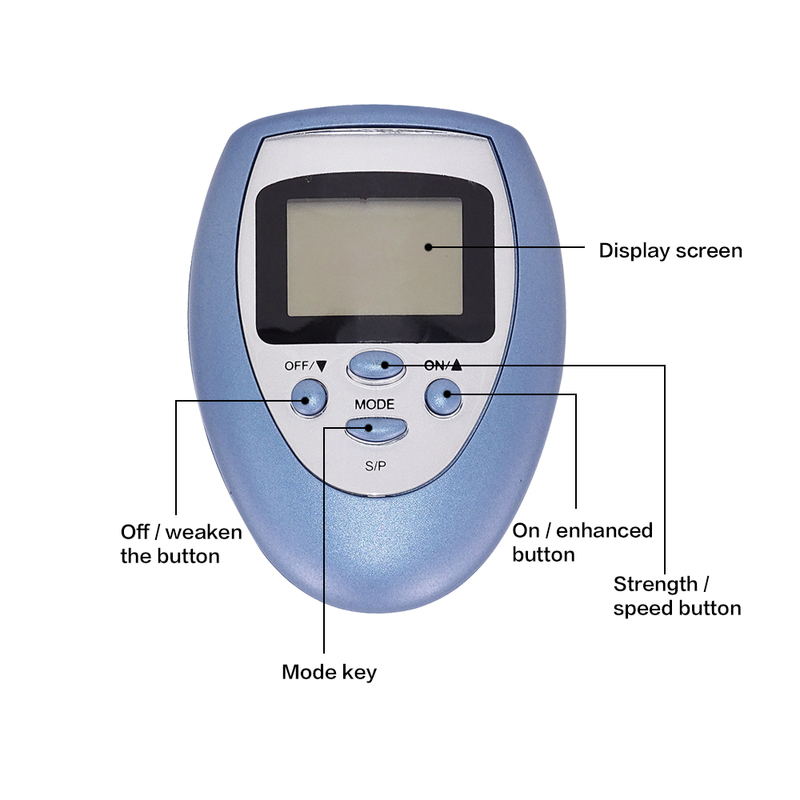 Purchasing an electrical muscle stimulator is an important step in living a life free of muscle aches and pain. 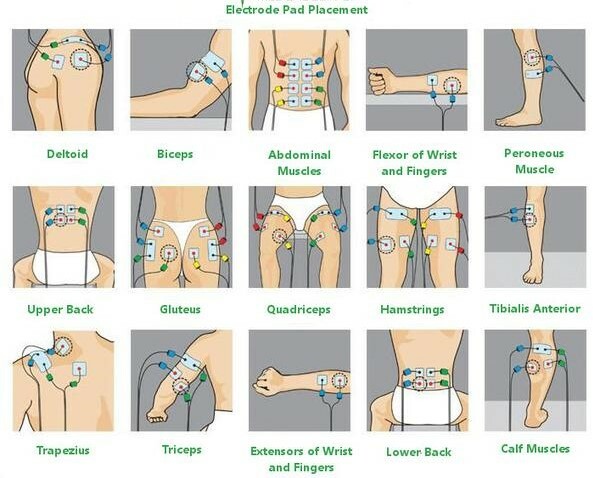 But it’s imperative that you buy, and then maintain, electrode pads that are effective in providing pain control. We recommend changing the quality pads every one-to-two months, or changing pads every 20-30 uses. 1. Put 2*AAA Battery into the controller (Not included as some countries do not allow shipment with batteries). 2. Connect the 4 pads to the controller. 3. Stick the 4 pads to the skin, when you use only 2 pads, the 2 pads must be from different channels. 4. Press " ON" to turn on the machine. 5. Press " ON" again to start electroshock. 6. press " ON"more times to intensify the electroshock power /Press " OFF" to weaken the electroshock power. 7. Press " S/P" the enter Speed Control, then press " ON" to speed up/ Press " OFF" to slow down. 8. Press " S/P" again to back to Power Control. 9. Press " MODE" to change electroshock mode. 10. Press " OFF" to turn the machine. 1. Please don't apply the massage pad when the device is on, otherwise, you will get a strong shock. Stick the pads on your body first before using. 2. There are 4 lines come out of two groups, when you use only 2 pads, they must be from different groups. 3. It DOES NOT work if you use only 1 pad, or 2 pads from same group! 4. If you feel some pads are not as powerful as others, it may owing to you didn't paste it on the symmetrical body parts. Please use the pads on your symmetrical body parts. It will work better. 5. Device don't work if it didn't connect with your body, please connect the " device--electrode pads--body " to massage. How does a TENS/EMS unit work? Simply place the electrode pads over your targeted painful area or acupuncture points or acupressure points, select the setting that’s right for you, and increase intensity as high level as you can stand or feel comfortable. Stimulates your bodies release of natural painkillers similar to morphine (endorphins and encephalins) which reduces your sense of pain. Electrical impulses created by the TENS can block some of the pain messages traveling to the brain. Provides a sense of control over pain and gives an alternative focus. What does a TENS feel like? You will experience a pleasant tingling sensation on the skin where the pads are placed. How long should a TENS machine be used for? The TENS machine can be used for as long as desired, typically 30 minutes up to 2 hours, several times a day if needed. There are NO chemicals or drugs, or creams involved. It is very safe for long-term use. Do I need to ask my doctor first about using this electrotherapy device? This device is designed for your personal use and is not intended to replace any professional medical or health care. When in doubt, we recommend that you consult with your doctor first. Why use a TENS machine? What should I know about using TENS? TENS has been used safely since the 1960's. However, there are a few precautions. Do not use over broken or desensitized skin. If you are pregnant do not use before 36 weeks unless approved by your doctor. Do not use if you have a pacemaker. Seek advice from a doctor if you have epilepsy. Can I use a TENS machine with other pain relief methods? Yes, you may continue using the TENS machine with other methods such as prescribed medication. How long will the electrode pads last? Replacement pads will usually last for one-to-two months or 20-to-30 uses. Apply pads to anywhere except the heart, brain area or a hernia. Apply the pads on or around the painful area always making sure a pair of same size pads are on nerves or muscles. The best way to relieve your pain is to find the pain points with fingers and apply the pads there. How to take care of the replacement electrode massage pads? Before applying massage pads, clean your skin first before you apply pads in pair. If the pads become dry, apply few drops of tap water or hand sanitizer to moisture pads. If the pads are too sticky due to local humidity, you may put the sealed pads in the cool fridge to last longer. Never leave the pads unattended, disclosure to the direct sunlight. Depending on the frequency and time of use, the electrode pads may shorten the life of use, normally it can last from one month to several months. If you find the pads lose their adhesiveness, you can simply apply a small amount of moisture to make them adhesive again, or if the pads are worn out, then it is time to replace the pads. To change the pads, just unsnap the button on the back of the pads and snap on the new pads, if it is pin inserted pads, just disconnect them and inserted a new pin pads. Once you put a new set of pads on, the device will work like new again. The electrode pads are not sticking, what should I do? Make sure that the protective plastic covering the massage pads have been removed before you apply the pads to skin at the treatment area. The electrode pads are water activated. Before each use, use finger tips to get some tap water and moisture the water onto each pad on adhesive side, then shake the pads for 3-5 times, the pads will become half dry and half wet, it will be sticky again, apply the pads to the skin at the targeted area. Make sure that the pads are firmly attached to the skin for better conductivity and adhesiveness. Remove the old pads and replace with new pads about once a month to ensure maximum effectiveness. Also, remember to place the pads back pads holder or plastic bag right after each use to keep clean and moisture for next use. Why do I feel stinging sensations from the electrode pads sometimes? The pads must be moist and sticky to work. Pads that are not moist enough will produce a weak and stinging sensation. Before each use dip your finger into some drops of tap water and rub the water onto the massage pads. Apply the pads to your skin when they are half wet and half dry. Make sure that the pads are firmly attached to the skin for better conductivity and adhesiveness. Worn out pads may also cause a stinging sensation. Replace the pads as needed. Even when you feel stinging sensations, you may just need to make sure that the pads are moist with water on the adhesive side of the pads. I can barely feel anything from the electrode pads, what is wrong? Check the wire connection to the pads and make sure the plug is securely plugged. Make sure the batteries are in excellent condition. Check the pads are moist and not worn out. Turn the switch off then turn on again. Please make sure both pads attach to same person’s body at the same treatment targeted area in order to feel the same sensation. Generally, increasing the intensity level gradually until you feel sensation strong enough, but comfortable. Issues for whatever reason sometimes happen. Here are some of the most common troubleshooting techniques to ensure you can get back to living pain free as quickly as possible. If your issue is not on the list feel free to send an email highlighting your troubleshooting question to support@yeembe.com. One pad feels stronger than the other. This is normal. Different areas of your body will react differently. Nothing needs to be done. Make sure the pads are moist and are making good contact to the area. During the treatment, the skin feels a painful burning sensation or the stimulation seems to be weaker. Adhesive gel pads are not adhering firmly to the skin. One other cause is the gel pads may be too dry. Apply a few drops of water to the adhesive surface of each pad and make sure the pads are pressed firmly to the skin during application. Unit is on, but no sensation is felt in the pads. Both pads are not firmly on the skin or there is a loose connection. The intensity level may also need to be increased to a higher level. Make sure both pads are firmly pressed against the skin. Make sure all connections are secure from the unit to the wires and the wires to the pads. Increase the intensity level. Adhesive gel packs do not stick to skin even after cleaning and moistening the gel pad. Adhesive gel pads need to be replaced. Unit does not turn on or the screen is dim. Does not provide adequate pain relief. Not using it long enough or frequently enough. Not lying down when treating neck. Use your unit for 20-30 minutes at a time, 3-6 times per day. Lie on your back for neck support when you need relief for headaches or neck pain. Low battery. Damaged massage pad and/or electrode wire. Massage pad is dry, dirty or does not stick. Replace electrode wire(s) and/or massage pad(s). Clean or replace the massage pad(s). Damaged massage pad and/or electrode wire. Skin is too dirty, oily or hairy. Reconnect unit to electrode wire. Replace electrode wire and/or massage pad(s). Wash skin thoroughly to remove dirt, oils, lotions and any impurities (Shave if needed). Make sure pads do not overlap. Test Channel port A with pads on. The test Channel B with pads on. If one of the Channel works but one doesn’t, you may have bad port. Contact Customer Support. Clean skin and massage pad(s) per instructions. Adjust placement of massage pad(s) (Refer to our Placement Guide for suggestions). You may be suffering from a chronic or serious condition.